What's Cooking in Gmail Labs? Gmail Labs is a secret underground bunker, far below Google Headquarters, where caffeine-fueled programmers try out experimental new features for Gmail. Even cooler, you can try out these new Gmail features to see if you like them. Basically these features are beta versions of the tools and you are the tester. If you find problems with an experimental Gmail Labs feature, you report back to Google so they can perfect it before officially releasing it to their users. The main advantage of using Gmail Labs is that you get to use fun and useful features before they are officially released to the great unwashed masses. Another advantage of using Gmail Labs is that you get to learn how to use a tool before everyone else, this means by the time the general public is using the tool you'll be a regular guru. But as in any beta program, there are also a few potential gotchas. The tool may not work perfectly and cause some amount of frustration. And it's also possible that Google may decide to remove an experimental feature, either temporarily or permanently. This can be a bummer if you've come to rely on it. Quick Links - This features is designed for people who want quick bookmark links to frequent searches and important messages within Gmail. After you enable this feature a box will appear in the left hand column of your Gmail homepage. Perform a search or navigate to an individual message, then click on "Add Quick Link" to save that Gmail URL. To access these URLs all you have to do is click once and you will be taken directly to the message or search results. I use Quick Links to scan my Spam folder for false positives, and move messages that match certain keywords back to my Inbox. Superstars - Adds additional choices for starring a message. You knew you could click on the little star next to the Sender name, right? That flags the message as important, but now you have twelve additional star icons to choose from. After enabling this feature, go to the Settings->General page to choose which superstar icons you wish to use. To star a message, click the star to rotate through your selected superstars. GEEK TIP: Use the search operator "has:" to find all messages flagged with a superstar (e.g. "has:red-bang", "has:blue-star"). Learn the name of each superstar by hovering over its image in the General Settings page. Quote Selected Text - Email etiquette requires that when you reply to a message, you should trim out everything except the text that's relevant to your reply. Enable this feature, then instead of hitting reply and manually trimming, just mark the desired text with your mouse before you hit Reply. Forgotten Attachment Detector - Have you ever sent a message and meant to include an attachment, but forgot? Enable this handy feature and Gmail will poke you if you mention attaching a file, but forgot to do so. This is a great feature that I've seen in other email programs, but it still needs some work. For example, it correctly prompted me when I wrote "I've attached a file..." but didn't trigger the prompt when I wrote "I'm sending an attachment..."
Mouse Gestures - Here's an alternative way to navigate within Gmail. Enable this feature, and then you can hold right-click and move the mouse left to go to a previous message, move it right to go to the next message, or move up to return to the Inbox. With a little practice, you can quickly move around with just a little flick of your wrist. Fixed width font - Gmail displays all your messages with a proportional font, which means that the letter "i" takes up less space than a "W". So if you're trying read a email that's formatted with tabs or columns, it will look terrible. This feature adds an option to the reply dropdown menu so you can view a message in fixed width font. This feature is handy, but doesn't feel very intuitive. Hey Gmail Guys, how about a feature to set my font to whatever I like, ALL the time? Picture in Chat - This tool is designed for people who want to see a face while they chat. Once enabled this Gmail Labs feature will display the profile picture of the person you are chatting with next to their screen name. Random Signatures - This feature will rotate the quotes that are printed at the bottom of your emails under your signature. Keep things interesting, randomize your sigs! Old Snakey - A throw back to the days of the Atari game console. Old Snakey is a simple game that you can play by enabling keyboard shortcuts and then entering '&'. This is a fun and simple game that will quickly replace solitaire as your lunchtime pass time. These are just a sampling of the Gmail Labs features you can play around with. So where do you get access to all this cool stuff? 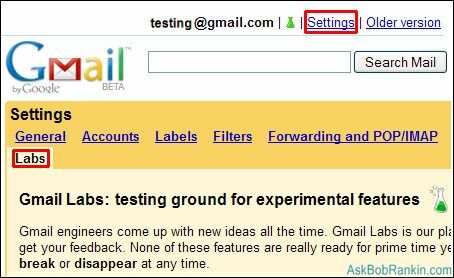 If you're interested in experimenting with Gmail Labs all you have to do is log into your Gmail account, click on "Settings" and then click on "Labs." To access the Labs option you will need to be using at least Firefox 2 or the Internet Explorer version 7 browser. Post a comment below if you want to rant, rave or ask a question about the new features in Gmail Labs. Most recent comments on "Gmail Labs"
Thank you for this article, I must do a little exploring!! Mouse gestures worked and is a time saver. The gadget that warns you if you use the word attachment or attached and fail to actually select and add the file or image did NOT work. Many others on the gmail forum also mentioned the same defect. Such a shame, since I am often guilty of this annoying goof up. Thanks for the great newsletter! -- Steverino in charming Edgewater along the lake in Chicago. This should be simple. It does not seem to BE simple. I have a text file, about 2.5 MB, that I would like to simply transfer, delete and transfer the updated version to Gmail. Is there a simple way to do this that Google supports? EDITOR'S NOTE: I'm not sure what you want to do. Something other than sending a large file to another person via Gmail? I could never get use to the gmail interface. No simple delete and show next message, nope, that would be too easy. You need memorize keyboard shortcuts. If you want to save an email to a conversation, or delete or go back, you need a photographic memory. Me? I hate keyboard shortcuts, and love the mouse...point and click! BTW, have you ever try to embed a photo in a gmail? Don't it's not worth the trouble, and it is a lot of trouble to do so. The only good thing about gmail is the massive amount of storage, thus I use it for storing some junk. Gmail lab needs to work on a total makeover, and not some silly features to an otherwise clumsy email program. Yahoo Mail is still the king of web base email! EDITOR'S NOTE: Hmmm, I've never had a problem emailing a photo with Gmail. Anyone else? I have enabled shortcuts and snakey but I don't know where to play.... it says type & in the main page but what main page? wnere do I type it? In an email - no... where. Sorry to be so dim! EDITOR'S NOTE: The main page is your Inbox display. Sorry, I didn't mean [i]attaching[/i] a photo, I meant to embed a photo in the main body of the text message area. It would be nice to type "Here is a photo of my grandson", and then have the photo displayed below the text. Having to open an attachment loses some luster. I've since found out, that a photo can indeed be included in the main text area, but it can only be included if you have a direct link to said photo, that is from a web site. You can't use a photo in the text area from say...'My Documents' on your computer, no you must first upload that photo from My Documents to a web site, then in the body of gmail, type in the link to that photo, and if your lucky, the photo will appear in the text area of gmail. EDITOR'S NOTE: Ahh, now I see what you mean. You are correct that the image must be on the web to be included inline. I also see others have requested that feature. Last Sunday, i chatted with my sister via Gmail IM it was automatically saved in chats folder. After that, I chatted with my friend it didn't save our conversation in chats folder. I checked everything in setting and chats list if check is on to save auto conversation. Everything is fine, but why didn't it save my conversation with my friend which it was really important conversation. Is there any way to recovery the conversation last Sunday?